1. 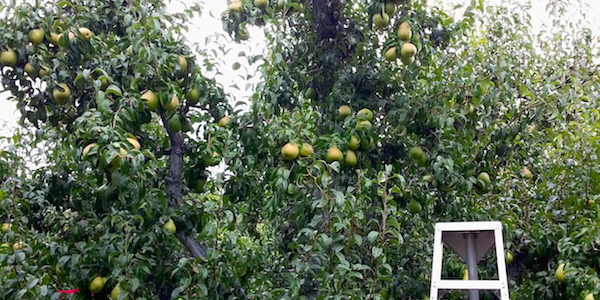 Determine maturity and quality variation as impacted by tree and orchard management regimes. 2. 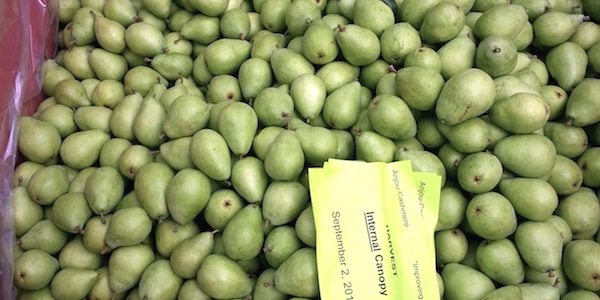 Correlate pear quality, maturity, and chemistry with DA meter evaluation and storability. D'Anjou has been trained for many years using an open vase. Single trees can reach 17 ft high with a very large canopy volume where fruits are distributed mostly in the upper-medium portion of the canopy. Fruit characteristics inside such a big and vigorous tree can be very different as less light can penetrate into the inside of the canopy and, consequently, light exposure can be quite different. 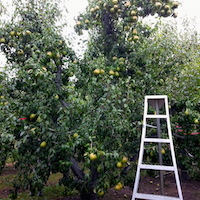 Harvest in those orchards cannot be mechanized and is performed manually without any sorting. 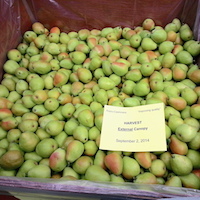 Consequently, many fruit quality characteristics, including maturity, can be highly variable within a single bin. 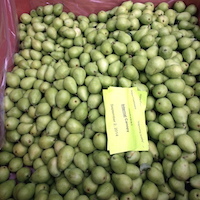 This factor can dramatically impact fruit quality and storability often resulting in the need to repack to eliminate over-ripe, spoiled and scalded fruit from packed boxes. Our preliminary work indicates a non-destructive approach using the DA-meter, which can be adopted to segregate pear fruit according to maturity by estimating associated chemical changes. We have found that fruit picked from the internal part of the canopy ripens more slowly, as estimated using the DA index, but loses weight more rapidly after three weeks at room temperature than fruit harvested from the outer part of the canopy. While sophisticated laboratory instruments will be used to determine specific changes and chemistry, we expect that, once characterized, differences in harvest maturity within the canopy and orchard may be evaluated using orchard or packing line-based tools specifically targeting these differences. 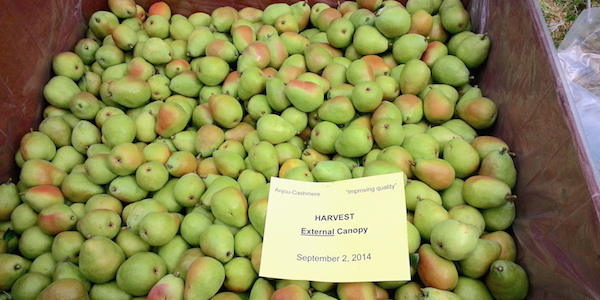 Our long-term goal is to develop tools and protocols that improve uniformity of fruit maturity and quality at harvest. Moreover, one possible long-term outcome is implementation of existing sorting technology to afford storage operators the ability to pre-sort pears by orchard or tree position/maturity. This sorting capacity would allow tailored storage regimes for improved ripening and quality consistency and reduced losses from postharvest disorders such as scald and possibly decay.